So far it’s all went down just like everyone thought it would in Brooklyn, with St. Bonaventure versus Saint Louis playing for a chance to go to the NCAA Tournament. Yep, no surprises there. 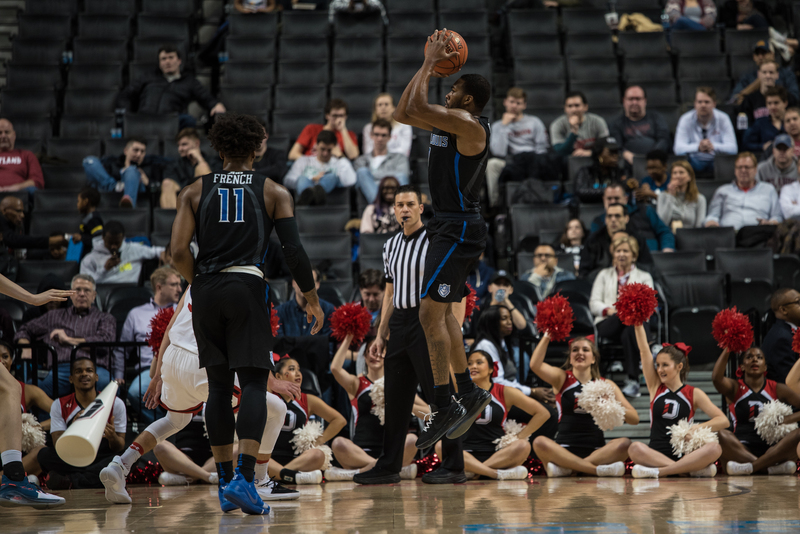 Travis Ford’s Billikens pulled off an emphatic upset of the 2 seed Davidson Wildcats, winning 67-44 on the back of a dominant second half that saw Davidson score 15 points and shoot 17 percent from the field. “I thought we competed at a high level, guys stayed locked it, they never rested, and that’s out of respect for Davidson and how powerful they are,” head coach Travis Ford said. This was probably the Billikens’ best game of the season, and seniors led the way for the Billikens. Javon Bess had his most effective game on offensive since mid-January, scoring 24 points on 10-14 shooting. He went 3-6 from the arc, showing off his three point stroke that he seems to have found again in Brooklyn. Tramaine Isabell was the offensive spark throughout the game, making highlight reel passes and draining deep threes. Isabell scored 19 points and added 8 assists. DJ Foreman continued his amazing work down in the trenches, scoring 9 points and getting 11 rebounds. 4 of those were offensive rebounds. “My role is to play defense, stop their best post player, and do anything that’s physical. We’re a very physical team. The more physical I can be, it makes it easier for players like Tramaine, Javon and Jordan to play their game” said Foreman. Foreman has been the unsung hero of these past 2 games. His work on the glass goes beyond the spreadsheet. He’s been boxing out and keeping balls alive. Even when he doesn’t get the rebound, it’s likely he played a role in SLU getting it. Bess’ offensive explosion was particuarly heartening to see, given his struggles with injuries lately. He was deadly from mid-range, only missing once inside the three point line, and came up with clutch buckets time and time again. Bess credited Isabell and Jordan Goodwin for his offensive success. “I was definitely in rhythm, but Tramaine and Jordan, they had the ball a lot and they were finding me” Bess said. SLU only played 6 players in the game until the game was well in hand, but Bess wasn’t concerned about the team being fatigued tomorrow when they play their 4th game in 4 days at Barclays Center tomorrow. Below I put together some keys to the game, and yes I did just copy and paste them and replace the stop JAG with a Bonnies specific one. Like I said last article, There’s not a lot of nuance to this team’s success honestly. Their best can beat just about any team in the A-10 straight up if they execute. Stay consistent: SLU has a tendency to ebb and flow, espeically offensively. However, with a team as good as Dayton, they can’t afford to have any dry spells. As the Billikens’ only reliable shot creator, a lot of this will fall on Isabell to get the offense going when things stagnate. Outrebound the other team: This one is obvious, but SLU’s identity is tied so tightly with their rebounding. SLU pretty much needs an outrageous rebounding margin to win because it makes up for their deficiencies scoring and hitting free throws. If DJ Foreman can play like he did last night, that will make a huge difference. Hit at least 60 percent free throws: It’s really hard to win when you only hit 60 percent, but if you’re under, you’re done for. SLU had one of their best free throw shooting games on the year, shooting 75(!!!!!) percent from the free throw line. Neutralize Osunniyi: Osun Osunniyi is the most talented shot block in the league, and the best freshman shot blocker in the country. In Olean, he really affected Tramaine Isabell’s effectiveness driving to the hoop. SLU needs Isabell’s penetration so they need to find a way to limit OO’s effectiveness on defense. Maybe that’s getting him in foul trouble, maybe Isabell has a solution or maybe Travis Ford has a schematic counter. Either way, Osunniyi is a very smart and athletic defender and he poses a huge challenge for SLU.